The remedies for maritime injuries to passengers and crew are different from injuries suffered on dry land. This is true for many reasons, but primarily it is due to application of federal statutes and the general maritime law. When someone is injured in Florida, Florida statutes and common law will apply. When someone is injured on the open water or “navigable” water, their recovery will be governed by federal statutes and the general maritime law. Like most everything else these days, the practice of admiralty and maritme law requires a degree of specialization and expertise to truly know what protections are available. At Michael F. Guilford, P.A., we focus our practice solely on helping injured people recover compensation after maritime injuries. Among these are injuries aboard container ship. Here are a few things you should consider if you are injured while working aboard a container ship. A container ship is a large ocean-bound vessel that carries “intermodal” containers. Containers are designed to be carried by truck or rail to the port and then lifted by crane and placed on board the ship. They are often stacked several rows high and several rows across. When the ship arrives in its destination, the containers are then lifted off the ship, placed back on trucks or rail cars and delivered to their final destination. In this way, a container can be loaded in another country and remain in the same container from the manufacturing plant in all the way to the final reciever. Perhaps the most common reasons for injuries are poor training of crane operators, poor condition of equipment or negligent operation of a crane. Loading and unloading is busy chaotic time and many things can go wrong. A cable can break, an operator can get distracted, a shipping container could topple, or a lashing chain could break. 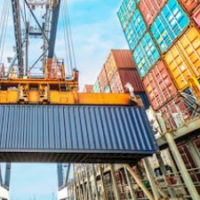 When a person is injured while working on or around a shipping container in the harbor, depending on his/her status (crew, longshore worker, civilian) there are a number or laws that could apply. This law applies to injured workers who are employed by companies that provide direct services loading and unloading ocean-bound vessels at U.S. ports. This law applies to injured seamen who are hurt while in the service of the ship. If you are not a longshoreman or a crewmember, then the Florida Workers Compensation Act (FWCA) may apply to your cliam for injury. Under the FWCA injured workers file a claim with their employer’s insurance company and seek payment under a specific schedule of benefits. If you are employed by a land-based employer and you were injured while delivering to the port or doing some other task near the container ship, you may have rights under the FWCA. If you are not covered by one of the statutory schemes, you may still be able to recover for injuries sustained on and around these ships, under the common law remedies provided by the Florida and the General Maritime Law. For help figuring out your best approach to compensation, call Michael F. Guilford, P.A. in Miami today. Consultations are free, so you have nothing to lose by calling. But time is limited, so don’t delay.